How Many Unicorns Sell Each Year? How many companies sell each year for $1B or more? 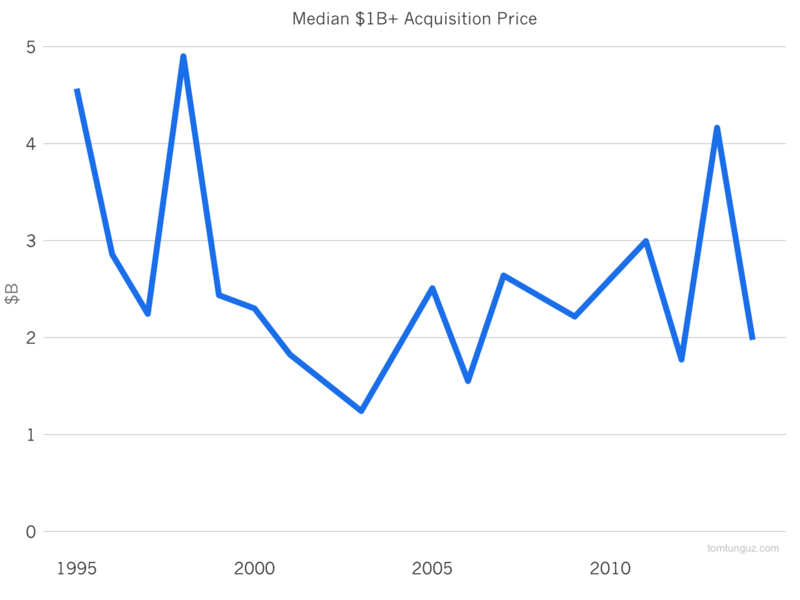 In the last ten years, on average, 2.5 US venture backed IT companies are acquired for $1B+. In the last ten years, a total of 20 companies have sold themselves for greater than $1B. Over the past 20 years, that trend has been relatively constant, with the exception of the euphoria in 1999 and 2000. The typical unicorn acquisition generates $1.9B in proceeds. Though there is quite a bit of variance in the trend, because the numbers of companies are relatively small, we cannot say that the typical large acquisition is increasing in size. It seems relatively constant around $2B. Each year for the past decade about $6.4B of total proceeds are generated from the sales of these companies. A greater than $1B acquisition event is an enormous event for the acquiring company. Often times, such an acquisition demands a significant amount of cash and stock as a fraction of total assets of the acquiring company. These are big, bold bets. As the aperture of innovation widens - we’re seeing new financial services companies, new logistics companies, etc - the possibility of more $1B+ M&A increases, because old world companies must evolve or become dinousaurs. 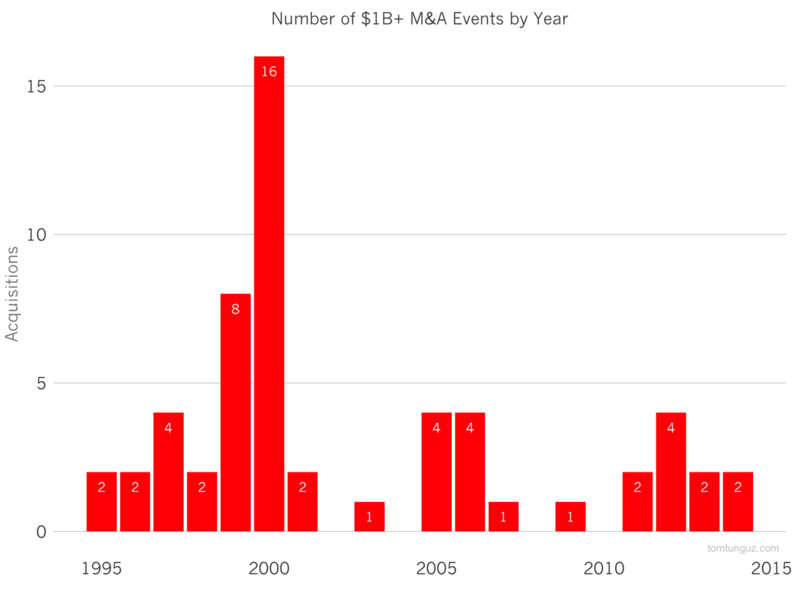 So there is some reason to believe the M&A activity should increase. Additionally, large tech companies have huge piles of cash on their balance sheets. How the richest segment M&A market will evolve is anyone’s guess. 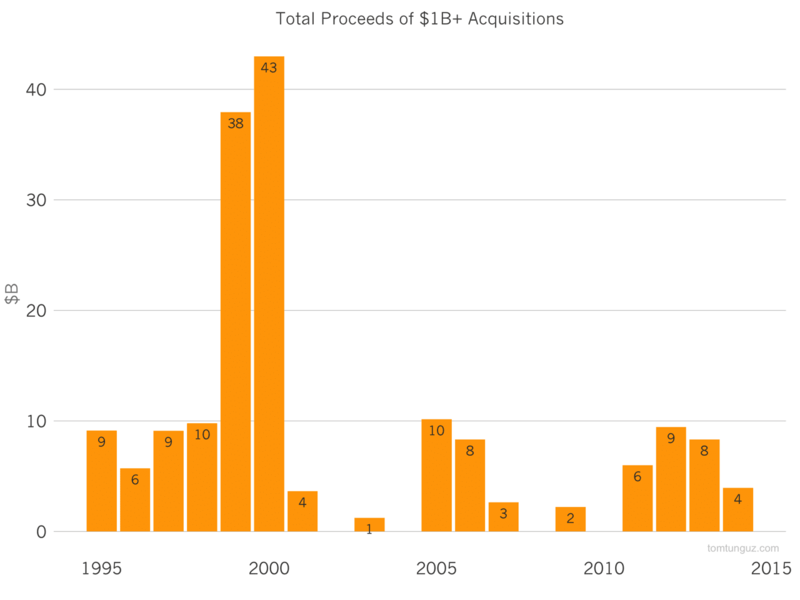 If the past is any indication, we’ll see 2-3 $1B+ acquisitions each year yielding $10B in proceeds annually.